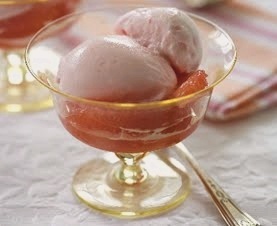 This Grapefruit Ice Cream Recipe using freshly squeezed grapefruit juice for the strong flavor and nice texture. Mix ingredients just before putting in machine. Very nice texture. Strong grapefruit flavor. Surprisingly good. Even those who grimaced on being told the flavor of the day had seconds. Note: Fresh squeezed grapefruit juice is far better than bottled. Also, use pink or red grapefruit. Vist me as you have time..I am always intrested in hearing from you.